Even in the face of funding challenges and historic precedent, there are emerging examples of how partnership between two-year academic institutions and designers can further elevate community on campus. CannonDesign's Carisima Koenig has a few key examples. A fundamental component of advancing our nation’s higher education system is enriching the community college experience for students. With 45% of all undergraduate students in the U.S. enrolled in community colleges, these institutions are critical to our country’s long-term success. Community college leadership teams recognize their key role in America’s education system and are working hard to provide the resources, degree programs and technologies these students need. Despite their best efforts, community colleges are often challenged to bring key, properly-sized community spaces to their campus due to current funding models for capital projects that prioritize the planning and design of core learning spaces. This prioritization is logical, however it often overlooks the value academic, social and wellness communities bring to a students’ overall academic wellbeing. In many ways, this funding challenge may stem from a common misconception that students who attend community colleges don’t need these spaces. That’s simply not true. With many community college students balancing full-time jobs (62% of full-time and 73% or part-time community college students also work full of part time) and raising children or caring for loved ones, these individuals are often challenged to find time to study and meet off campus, further exasperating the need for more student life spaces. Plan. Research. Understand Your Students. 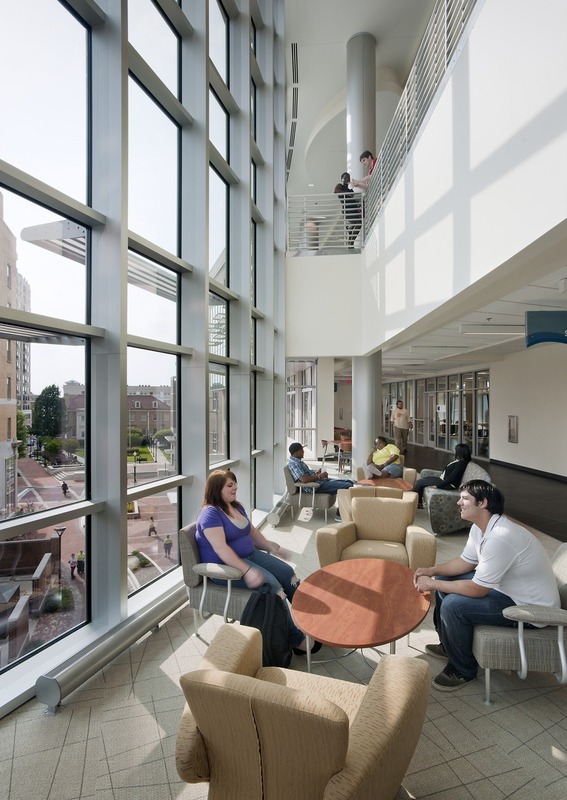 Tidewater Community College’s Norfolk Student Center is a shining example of how universities should integrate right-sized student community spaces. Click photo to enlarge. When community colleges do secure funding, they need to make sure they invest as strategically as possible. The first step in achieving this and creating successful campus spaces is understanding the students who use them. Looking to revitalize and reallocate space for its campus library, academic buildings and student life areas, Howard Community College (HCC) recently took on a rigorous and extensive research effort to create an updated campus masterplan. HCC set up focus groups with faculty to create student identify profiles and then mapped how those different profiles would use campus spaces. Through this analysis, HCC was able to see which facilities would drive the most community compared to others. This helped them begin to build a road map for which capital projects to invest in to spur the maximum community across campus. HCC also invested in environmental scans, campus assessments and extensive regional demographic and economic research to help them best assess their current and future student populations. HCC is now better educated on how to invest moving forward to create enhanced community college spaces for students. All community colleges should take on this kind of research to understand their students, populations, communities and facilities in order to strengthen their case for funding, and also ensure they push for the most advantageous capital investments. While individual student life projects may not always be approved and funded, states recognize their institutions need to provide 21stcentury learning environments. The need to upgrade out-of-date facilities may be an opportunity to enrich the student life experience. Ohlone Community College is seizing such an opportunity with the introduction of its Academic Core Project. 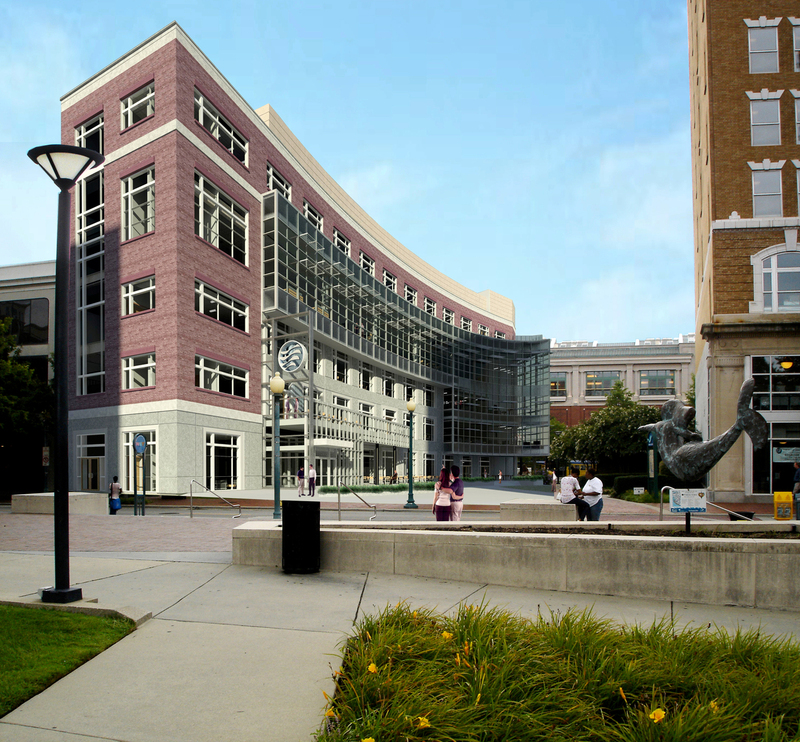 Needing to update its classroom spaces, Ohlone used these updates to catalyze the construction of three new academic hybrid buildings totaling 180,000 sf in the heart of the campus as well as improvements and updates to other buildings in the campus infrastructure. Along with helping the university solve its need for upgrades and expansion, the project introduces a new science center, art building and learning commons, which will include library tutoring labs and collaborative learning centers which will provide spaces to build community and enhance learning. The campus transformation also introduces ample spaces for community including “collision zones” that encourage formal and informal opportunities for student learning and collaboration. 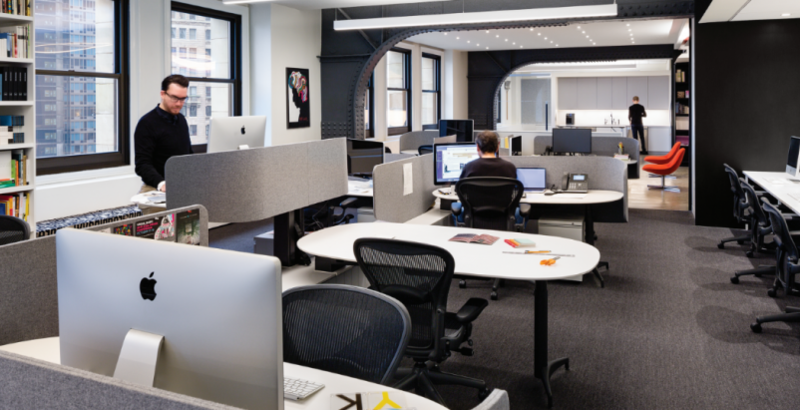 Other community colleges can team with designers to model this innovative approach. 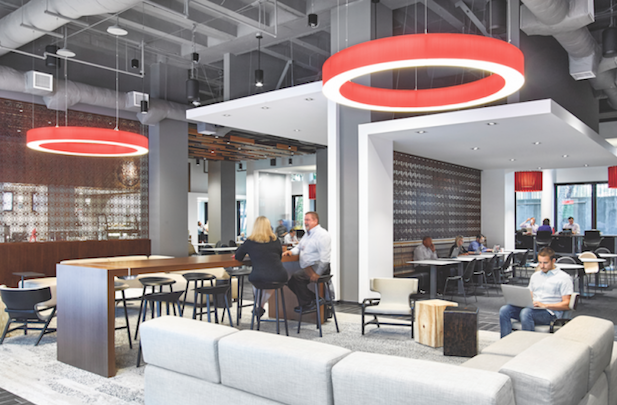 When it comes time for necessary academic updates, institutions can think about how they can increase the value of their investment by infusing student life and community spaces into the effort that help students learn, study and grow while on campus. Students leverage community gathering space at Tidewater Community College’s Norfolk Student Center. Click photo to enlarge. Community colleges need to continue to push for full-scale campus life facilities, and when they secure funding, they need to lead the way by creating powerful examples other institutions can follow. Los Angeles Valley College (LAVC) and Tidewater Community College (TCC) have demonstrated this in recent years. LAVC recently completed a new student union at the heart of its campus that introduces a cafeteria, campus bookstore, student health center, business office and student union offices. Unique design features of the union include a new, “Lion’s Den” with dedicated space for students to gather and relax between classes with a coffee bar and a skybox that offers panoramic views of the campus from an outdoor patio and walkway, with sheltered seating underneath for student gatherings. On the other side of the country, TCC, one of the largest community colleges in the nation, opened its Norfolk Student Centre located within Norfolk, VA’s commercial and historic district. The center offers indoor and outdoor gathering areas (seating walls, steps and outdoor dining tables) for students to study, present and meet. The center is a home for the college’s student organizations and a forum for different programs and events. Moreover, the center boasts lounge, study, fitness, dining and childcare areas for students. These student centers at LAVC and TCC are breakthroughs for the world of community colleges. Other institutions should point to them as examples they can follow if granted the opportunity. Additionally, other community colleges should learn how these institutions leveraged research and design partnerships to right-size their facilities and strategically combine academic and student-life spaces to catalyze community and help students succeed in the classroom. These student centers are the type of space more community colleges need, and hopefully they will spur new momentum. With more than 12 million students enrolled nationwide, community colleges are integral to higher education in America. Leaders at these institutions recognize they need to find new ways to introduce student life and collaboration opportunities on campus. They’re trying to move forward, but need further support. It’s time to push for policy change and funding reform. It’s time to further democratize education. It’s time for the design community to help level the playing field between two- and four-year institutions in order to provide exceptional educational experiences to all of our future leaders. About the Author: Carisima Koenig is an accomplished designer, planner and manager of academic environments. 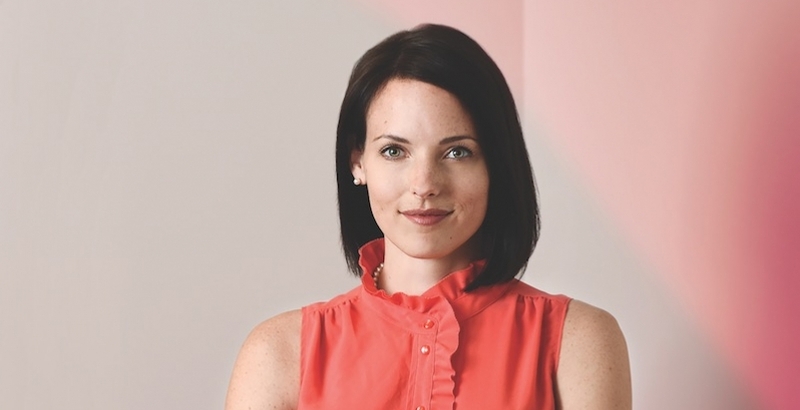 As a Co-leader of the firm’s New York City education practice, she advances the delivery of creative design solutions for our clients—while prioritizing and aligning institutional expectations, visions and goals. Her passion is shaping higher education environments that enhance growth and discovery.